The Grove has worked with Neil for a number of years in the past on management and commercial advice issues. They are now happy and proud to offer Neil full management. 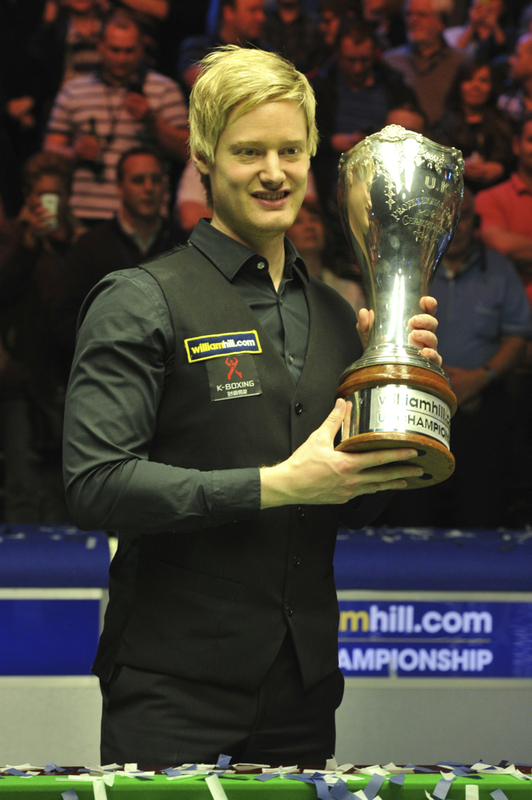 Neil Robertson (born 11 February 1982 in Melbourne, Victoria, Australia) is an Australian professional snooker player and the current World No 1. 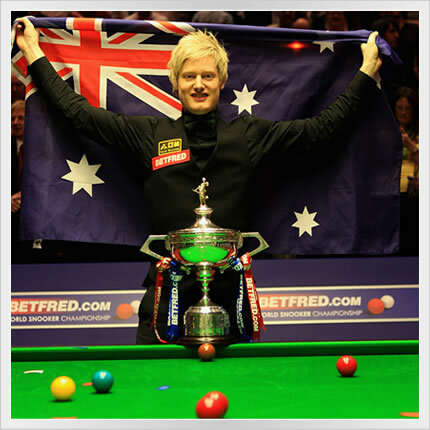 Robertson is the only Australian to have won a ranking event, in fact he has won 9 of them up to now, including the World Championship in 2010 and the UK Championship in 2013. He also won the Masters in 2012. The 2013/2014 season was a particularly successful one for Neil. Neil was the World n°1 player for the best part of the season. He finished the season as World n°3. He won the Wuxi Classic 2013 and the UK Championship 2013. This last victory made him a member of the select small group of players having won the “triple crown”. Neil was also finalist in the Australian Open 2013 and the China Open 2014. He reached the semi finals at the World Championship 2014, narrowly losing to the eventual winner Mark Selby. He also broke the record of centuries made over a season – he made 102 of them! The magical 100th century, the “ton of tons”, came during his quarter finals match at the World Championship. Neil started the 2014/15 season very strongly, winning the Wuxi Classic 2014 and being runner-up to Judd Trump in the Australian Open. But after that it was, by his standards, a rather disappointing one. He reached the final in the Masters, losing to Shaun Murphy, and won the Gdynia Open 2015 but didn’t go past the QF in any full ranking event. Despite this, he finished the season as n°3. The 2015/16 season was a bit of a mixed bag for Neil. He won two big events in the first half of the season, the Champion of Champions and the UK Championship, but the second half was a bit disappointing. He made another final, runner-up to Ronnie O’Sullivan in the Welsh Open in Cardiff, but suffered early exits in the last three tournaments of the season, in particular, he lost to qualifier Michael Holt in the first round in the World Championship. The 2016/17 season started well for Neil as he won the season opener, the Riga Masters 2016, bringing his tally of ranking titles to 12. He also reached the semi finals of the World Open 2016 and the European Masters 2016. In the latter he lost by 6-0 to Ronnie O’Sullivan and somehow it derailed his season. Indeed after that his results were disappointing by his high standards. He lost in round 1 of the UK Championship, as defending Champion. After losing 13–11 to Marco Fu in the second round of the World Championship in a performance he described as very poor, Neil vowed to play with more passion and more aggressively next season. Doing this, he hopes to improve his game and make it more interesting for the viewing public. 2017/18 was a difficult season for Neil who opened up about the mental health issues his partner has been suffering over the last years. Such circumstances make it difficult to focus 100% on snooker, quite understandably. Neil suffered a number of early exits but, taking perrspective, still expressed satisfaction at the end of the season. Privately things are slowly getting better, his appetite for snooker is back and, despite the circumstances, he managed to win two titles: the Hong Kong Masters 2017 and the Scottish Open 2017. At the age of 90 years my mother Edda discovered Snooker and is watching every game on Eurosport. I asked her who her favorite player was. Her answer: Neil Robertson! I think an autograph card with your siganture would make her very happy and i would be very thankful if you could send her one. Could u please send me an autograph? Does he exhibition matches and does he teach ? Im a great fan from germany and i love to watch your absolut imposant playing. :-) i would be very glade to get a personaly autograph from you. Firstly congratulations on winning the UK Champ 2015. Absolutely fabulous to watch you play and your 147 was superb! My wife and I both are your super fans and we will be so thrilled to get your autographed card if it is at all possible! Wishing you best of luck and I look forward to see you in winning another World Championship next year! I am the President of the Twin Towns Services Club Snooker Club located at Tweed Heads NSW Australia. The immediate past President of the Club, Des Turner was awarded an OAM in June for his services to the sport of snooker. Des was Mr Snooker in the far north coast region of NSW and southern Queensland for well over 30 years. We are planning a celebratory dinner in February and to be attended by many snooker dignitaries and enthusiasts and to add to the occasion would it be possible for you to provide a congratulatory email to be read out at the function. Des wast Club President for about 35 years, Far North Coast Snooker Association Secretary for about the same period, convenor of Referees in Queensland for about 20 years and has been awarded Life Membership of the Queensland Billiards & Snooker Association as well as Twin Towns Services Club. There has not been many snooker or billiards players awarded such an honour, Eddie Charlton was awarded an MBE and possibly Walter Lindrum but I am not certain of the latter. As the most prominent Australian player, former World Champion and World No 1 it would be greatly appreciated if you could forward an email as requested. I am certain it will hold pride of place with Des’ alongside his OAM. Trusting you may be able to help a fellow snooker enthusiast. I have been a big fan of yours since you were a young lad just starting out on the world snooker stage and have followed you ever since and watched you progress through the ranks to the top. You have given the game so much dedication and commitment over the years and have achieved so much as well as bringing your fans some truly memorable snooker moments. It is always great seeing young players do well and you have shown that anything is possible if you work hard and give your time to something you truly enjoy. I would like to thank you for all the tension and excitement you have brought to snooker and for the way you have conducted yourself from coming into the game to the present day, you are the ultimate professional and always one to watch in any snooker tournament. Never lose that Aussie sense of humour Aussie determination to achieve and succeed in the sport you love as you bring your fans so much watching pleasure in every game you play and keep us hooked with every shot you take. Was gutted that you didn’t make it to the final after playing Judd Trump at Alexandra Palace (19/01/2019) but I thought you played well and i’m sure the pressure was on you both. You and Judd in the same game what more could an ardent snooker fan ask for? You were are both winners and true professionals of the game! All the very best from one of your biggest fans!